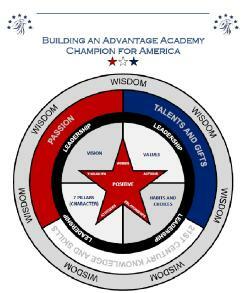 Part of the mission of Advantage Academy is to create an educational environment which addresses and has a positive impact on the whole child. We believe that every person consists of body, mind and spirit. When schools do not address the needs of the spirit (knowing that they were uniquely created for a special purpose and are valued), it creates a “hole” in “whole child” education. In this, we have identified ways in which we can, legally, create an academic environment to help fill this hole. Public schools can welcome, affirm and engage students’ religious values and beliefs. We believe that doing so will help students connect their lives to their learning. We engage students and families existing religious orientation as a learning asset to help them succeed academically and behaviorally, through our Family Engaged Learning program; this is done in social studies classes, through Texas Education Knowledge and Skills (TEKS) requirements. We teach about religion as an academic goal, through the study of American history and literature. These subjects, especially, have (TEKS) standards which are expected by the state of Texas. We examine behaviors through the lens of values and beliefs, which help shape their lives and their decision-making. We promote personal and social responsibility by helping students learn to work with others and by providing community service opportunities. We celebrate January 16th as Religious Freedom Day, as declared annually by the President of United States. We incorporate faith-friendly policies and practices, which have a positive effect on 21st century skills, such as providing critical thinking skills and learning to work with others in order to analyze and evaluate their own lives (HS). We provide teacher/staff training, which aligns with the U.S. Board of Education policies, and outlines our students freedom of religious expression. (see student-parent handbook for specific policies). We partner with faith-based and other organizations in order to meet the needs of our students, such as providing a mentor or assisting parents with physical or emotional needs. We create a faith-friendly environment that welcomes and engages students’ deeply-held beliefs and provides an inclusive culture and respect and acceptance to all individuals, no matter their beliefs. We empower students to be leaders in their school and community to discover their gifts, their service and skills to be healthy and hopeful citizens. We affirm America’s historical figures and inspiring leaders, who have demonstrated inspirational leadership qualities, which model the desire for a positive, happy and successful future (such as Abraham Lincoln and Martin Luther King, Jr.).